Leonie Wade has been brought in to take the Robins forward, after they narrowly secured their Premier League Southern Division status last season. Swindon say that Leonie has a vast football background from across the world, having held positions in the USA and most recently with West Ham United and Blackpool Wren Rovers. 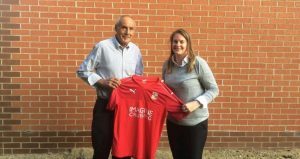 Having recently moved to the Swindon area, Wade feels this is the perfect time to get involved with the club and aims to build on last season in the FAWPL. “It’s an exciting time for the club after gaining promotion and finding our feet in the league last year, and we believe we can push on from the great work Steve and the team have done over the last 3 years. “I’m excited about this team and what the future holds and I hope that we can continue to develop as a club as well as pushing individuals on to reach their potential. Open pre-season training sessions for those wishing to play in the 1st team or Development side are being held on 13, 18 & 20 July at the Gas Club in Swindon from 7pm.